A Web Server takes a Client request and gives something back to the Client. finds the resource, and returns something to the Client Sometimes that resouce is an HTML page. Sometimes it's a picture. Or a PDF file(Data). Doesn't matter- the client asks for the resouce and server sends it back. When we say "server", we mean either the physical machine (hardware) or the web server application (software). Real time example. 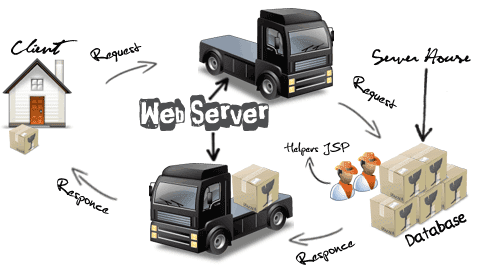 Above picture some transaction between Client House and Server House for transportation using Truck(Web Server). Client House need package (Truck Driver taking Request- URL) and pass the information to Server House. In the Server House Workers( Helper - JSP Files, Server side files) load the package into the Truck. It taking back to the Client House. When we talk about clients, througn, we usally mean both(or either) the human user and the browse application. The browser is the piece of software(Firefox or Opera) that knows how to communicate with the server. The browser's other big job is iterpreting the HTML code and rendeing the web page for the user. HTTP is the protocal Client and Servers use on the web to communicate. The server uses HTTP to send HTML to the client. The HTTP protocol has serveral methods, but the onew we'll use most often are GET and POST. GET is te simples HTTP method, and its main job in life is to ask the server to get a resource and send it back. That resource might be an HTML page ,a PDF etc. Doesn't matter. The poing of GET is to Get someting back from the server. POST is a more powerful request, IT' like a GET plus plus. With POST, we can request something and at the same time send form data to the server. If you know any information about this topic please comment.. I would like to suggest some changes to the contents of the blog text. First thing is that the discussion has started correctly about web server and then started explaining somethings that a Web Server doesn't do. I mean there should be a discussion about Web Server vs Application Server. The description of GET and POST is not correct, as per me. Per search on net and get more precise information. 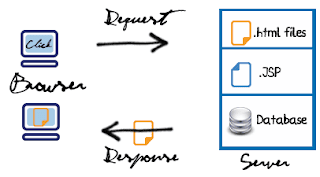 POST method is used for more data size, a separate socket connections are made to server application to transfer the data. ex. file upload. another thing to mention is, in any cases data is always given to the server, server logic may or may not return anything in response. Other than this the contents are nice, some points like above will make it nicer. hie srinivas,........plz explain how jsp and html pages get connected........plz post yaar.....! !